Conducted Disaster Recovery assessment and provided DR plan using industry best practices to bridge the gap between current and future state for IT disaster recovery. Established DR framework: provided strategy, repeatable processes and templates for DR plan deliverables as well as oversee the implementation of framework. Work products included IT business impact analysis (BIA), identification of key dependencies supporting critical processes, an IT incident response plan, and BC and DR plan templates. A large storm knocked out power during the holidays and badly damaged the Exchange server. Macro.CCS got it up and running, but it had lost RAID and another drive failure would bring it down completely. Macro.CCS had Play Visions purchase a new server and over the holidays installed Exchange and moved all mailboxes, public folders and Exchange settings over to the new stable server. Other than the power outage there was no mail downtime. Straightforward implementation of Exchange 2007. Also implemented new backup solution using CA ARCserve and managed anti-virus using NOD32. Using Ghost and mandatory profiles annually reimaged the SSW computer lab. Tested and assured compatibility of all software applications. 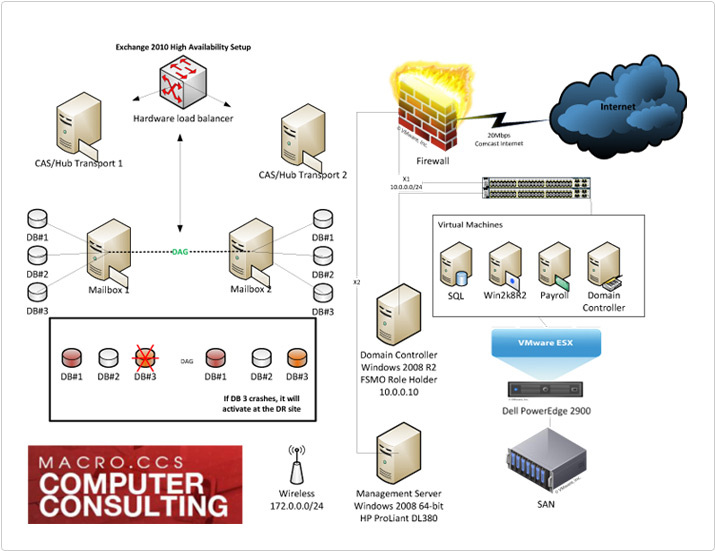 2 ESX hosts connected to a Dell ISCSI SAN using vSphere Essentials and P2V all servers. Upgraded all components of AD to 2003 including preparing the infrastructure, DNS and DHCP.